Following along the lines of my “Does it fit?” posts, I needed to take my bike with me today and got to do a fit test. I started by folding down the back seats (split bench, I folded both) and then laying down the pet cover I used for transporting the dog on the exposed rear side of the back seats and even covered some of the all weather mat. This minimizes any actual damage and I already had the cover anyway. I found with that set up everything fit nicely into the car and nothing looked like it would rub. 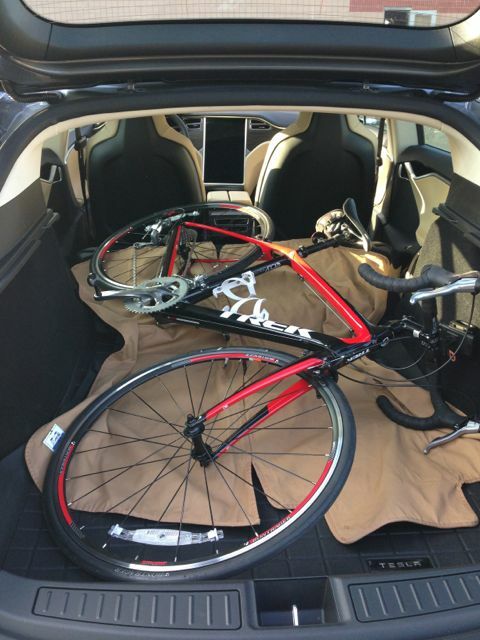 The Trek Domane is an amazingly light bike so lifting it into the Tesla and positioning it correctly was easy. I’m not a huge bike person, I ride for exercise and enjoyment and this is my first street bike. After putting 1,500 miles on my Trek hybrid I splurged (seems to be the year for that!) 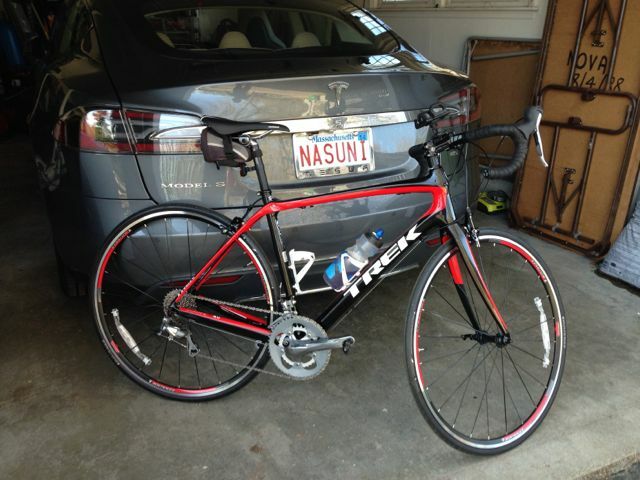 and got this road bike. Anyway, I prefer not to have to remove wheels, add external bike hitches, etc so I was pleased that it fit well in the Tesla. After putting it in and taking it out a couple times I decided rear first is the best way to do it as the front turns and can make adjusting things and avoiding scratching interior services difficult. Rear in was easy, but remember to keep chain up always. Being adventurous I experimented with different ways of loading the bike to try and get at least one rear seat up and usable. By lifting the bike up I could raise the smaller seat (60/40 split) but as you can see, the seat on the bike infringes on the passenger space. While someone could potentially still sit in that seat its not going to be comfortable and perhaps not safe. In the end my conclusion is if you put a bike of this size in the Model S you lose everything but the front seats unless you’re willing to dismantle the bike. You could also fit luggage, another bike and stuff like that, but just not extra people. 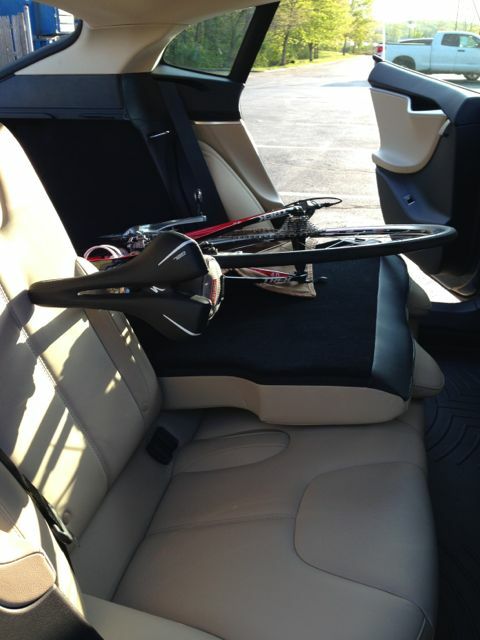 In the end the Model S is equally as capable carrying my bike inside as my old Acura MDX had been. This post first appeared on Teslarati. I believe someone even fit a tandem inside an MS without removing a wheel! That would be a cool picture! How about you get a rear or roof-mounted rack for your bike. That’s what I do with this bike: https://www.morpheusbikes.com/product-page/kopie-von-conspiracy-standard-build. It’s convenient and not to mention, a legal way to carry bikes when you travel. Because I dont do it very often and that way would reduce efficiency/range.